Mound the flour on a clean cutting board or work surface. Using a fork, make a well in the center. Add eggs to the well. Using a fork and working from the outside of the mound in, gradually mix the flour into the egg mixture. Continue mixing in flour until dough forms. Work dough into a ball and then knead until dough is smooth and elastic, about 5 minutes. Wrap in plastic wrap and refrigerate while preparing Filling and Bechamel. Scrub potatoes and celeriac with vegetable brush under cold running water. Place in large saucepan and add cold water to cover completely. Heat to boiling, then reduce heat to simmer. Cover and cook until tender, about 15 minutes. Drain well and turn into large bowl. Peel celeriac and cut into chunks. Place in saucepan and add cold water to cover completely. Cover and cook until very tender, about 15 minutes. Drain well. Puree in food processor. Add to mashed potatoes and mix well. Divide ravioli dough into fourths. Roll each portion out on lightly floured surface until very thin, or put through pasta roller. Cut rolled out dough into 12 (3 to 3 1/2-inch) squares. Spoon about 1/4 cup potato/celeriac mixture into the center of 6 of the squares. With back of spoon, make an indentation in each potato mound. Carefully spoon one egg yolk into indentation of each ravioli. 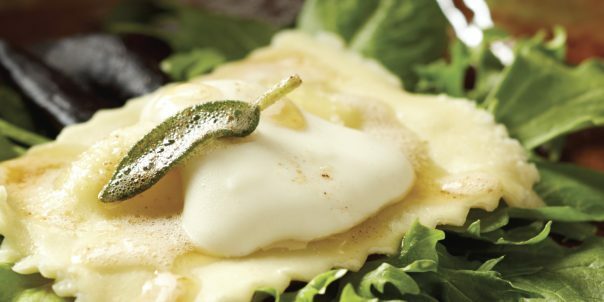 Brush edges of ravioli with the beaten egg. Top each ravioli with one of the remaining squares. Seal edges by pressing with fork or fingers. In large saucepan over medium-high heat, melt butter. Reduce heat and simmer about 10 minutes, stirring occasionally. In medium skillet over medium-high heat, melt butter. Cook until butter just begins to brown. Stir in sage leaves and cook another 2 to 3 minutes. Set aside. Whisk vinegar, honey and oil until blended. Add micro-greens and toss lightly. Bring large pot of salted water just to boiling. Gently lower ravioli into water. Cook just until pasta is al dente, about 5 minutes. Lift out with slotted spoon to drain. Divide microgreen salad among 6 plates. Top salad on each plate with one ravioli. Spoon about 2 to 3 tablespoons Béchamel Sauce over each ravioli. Drizzle with browned butter and garnish with sage leaves.